Want to use integrated EDI processes without having to manage the infrastructure ? All you need is a simple Internet connection to access a secure working environment. 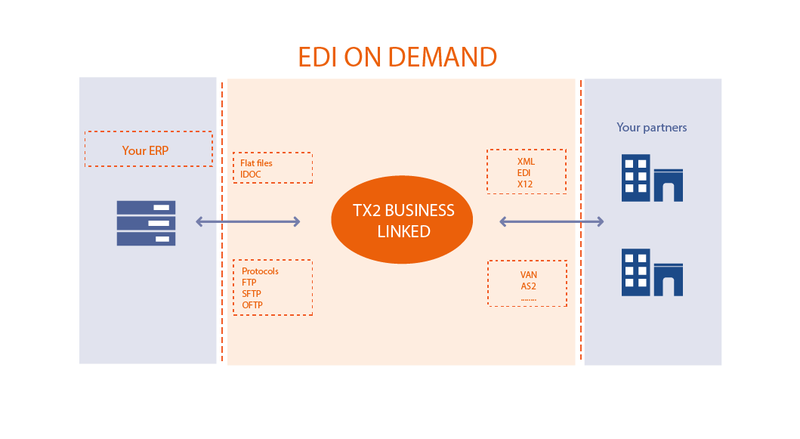 Why not use our B2B TX2 Business Linked® platform? You benefit from all the features of an EDI system, while we handle the operation, maintenance, monitoring and all technical relations with your partners (customers/suppliers). Available 24/7, our shared secure hosted services, with unlimited user-settable alerts (e-mail, text message), offer you total peace of mind. Our teams carry out daily multilingual monitoring of your exchanges with all your partners and provide all associated support functions. Multi-message: DELFOR, DELINS, ORDERS, DESADV, RECADV, INVOIC, KANBAN, etc. Multi-network and protocol: ALLEGRO, ATLAS X400, GXS, FTP, FTPS, SFTP, OFTP, OFTP2, ENX, AS2, etc. Relations with your IT service providers, customers, logistics specialists, etc. Study and implementation of a reliable, secure means of communication between the company information system and the TX2 Business Linked® server.